This machine uses compressed air as the power source to produce powerful whirlwind near the natural desquamate garlic. This machine is composed of two parts, the drying drum has the function of hot air circulation. Even in humid climates, garlic remains dry. The peeled part is powered by air compressors, saving electricity. The machine uses food grade silica gel, using the gap between the upper and lower silica gel plate and centrifugal force to squeeze the whole garlic head, garlic stem, garlic head is blown away from one side of the fan, can be recovered; The split garlic clove rolled out from the other side of the machine. Ginger slice, shallot slice, garlic slice. It can stir the fresh or bloated capsicum into small pieces or pelitomorphics. Meanwhile, it can cut the garlic, ginger, potato, spinach, onion or lotus root into pelitomorphics or strips. It’s a good choice of flavoring plants and processing plants because the amount of knives is freely used. To shoot or yams,carrots and fruit slices or thinly sliced, cutting products smooth surface and tidy.Suitable for the market,fast food delivery or food processing use. 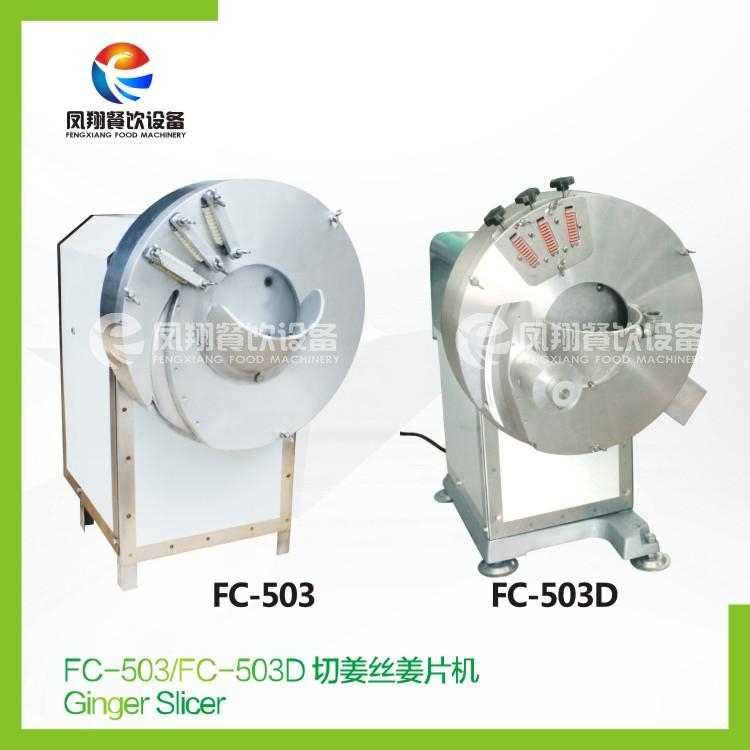 It's similar to FC-501 with lower capacity.It slices or cuts into strip for ginger, carrot, bamboo shot or small melons.